Beech Grove, IN (March 29, 2018) — Sarah Tittle Bolton was Indiana’s unofficial poet laureate from the 1850's until her death in 1893. She was also one of the first poets to gain a following in any of the Midwestern states during the pioneer era. Born in 1814, Sarah saw one of her poems published in the Madison (Indiana) Banner when she was 14, an astonishing achievement for a girl at a time when literature was considered the province of men. From that point onward, until she reached 18, she contributed poems regularly for publication in both the Madison and Cincinnati newspapers. At 17, Sarah married a young newspaper editor, Nathaniel Bolton, and returned with him to the infant state capital, Indianapolis. In 1847, Nathaniel was elected Indiana State Librarian and found his duties included maintaining the Statehouse. In 1850, Gov. Joseph Wright decided to hold an important public reception in the Statehouse, which badly needed cleaning and a new carpet. Sarah Bolton was also an early proponent of women’s rights in Indiana. In 1850, she aided Robert Dale Owen as he attempted to incorporate the right of women to hold property in the state Constitution of 1851. Much later, she was a close friend of May Wright Sewall, the indomitable advocate for women’s suffrage and equality with men. In 1855, Nathaniel Bolton was appointed U.S. consul to Geneva, Switzerland by President Franklin Pierce, and Sarah accompanied her husband to Europe, where she traveled in Germany, France, Italy and Austria. In 1858, Nathaniel died, and Sarah returned to Indiana. The feast of mystic manna. A free and safe asylum find. Unfortunately, Sarah T. Bolton did not find commercial success with her writings. She published one volume of her poetry at her own expense and lost money on the venture. But her literary works circulated widely, and she was cherished by some of the next generation of Hoosier authors, such as James Whitcomb Riley, a young poet whom she encouraged and who visited her in Beech Bank. 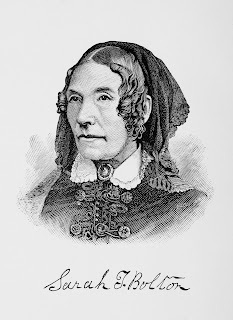 Although she did not gain wealth through her writings, Sarah Taylor Bolton was recognized by some of the great literary figures of the day as an outstanding poet. New York newspaper editor and nature poet William Cullen Bryant thought her Civil War poem “Left on the Battlefield” to be one of the greatest war poems ever written and included it in a collection he published of the 50 greatest such poems. In 1941, Gov. Henry Schricker dedicated a bronze tablet honoring Sarah Bolton’s literary achievements in the rotunda of the Indiana Statehouse. Her home, Beech Bank, has been preserved on South 17th Avenue in Beech Grove.